Nepalese Society of Texas (NST) is organizing a Youth Satsang program with Guru Chinta Mani Yogi, who will be talking about how to live a meaningful and fulfilling life, aimed at Nepali youths living in and around DFW Metroplex. Dr. Chinta Mani Yogi is a well-known scholar of Eastern philosophy, social worker and educationist. 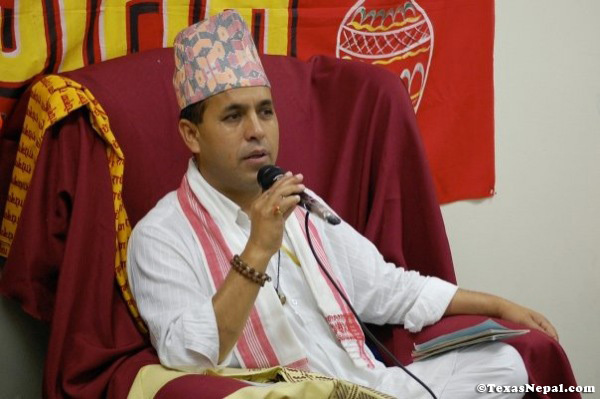 He is the founding principal of Hindu Vidya Peeth – Nepal, a non-profit school focused on promoting value-based education as well as helping children from poor families get education. Dr. Yogi teaches yoga and meditation. He has been coming to Dallas every year since 2008 to conduct Summer Camp, organized annually by NST in coordination with Nepalese Cultural and Spiritual Center (NCSC), where he has been teaching Nepali kids from DFW area about Nepal, Nepali language, Nepali culture and traditional values, Eastern morale and more. He is in Dallas this year for the ongoing third Summer Camp which has been scheduled from June 13, 2010 till June 27, 2010. Dr. Yogi’s message of non-violence, selfless service, tolerance and inter-religious harmony has inspired Nepalis both inside and outside the country. His past visits to the United States have proved to be very beneficial to many of us self-realization and self-awakening. We request all Nepali youths living in DFW area to attend the event and benefit yourself from the spiritual discourse with Dr. Chinta Mani Yogi.